Green tea is renowed for being a wonderful antioxidant, fighting off free radicals and is also a natural anticeptic. The great thing about bathing in green tea, is that the skin which is our largest organ absorbs the nutrients. I add powdered green tea which colours the soap to a beautiful olive green. The bath pouf helps increase the lather, also exfoliates and you can hang it after your shower. What more could we want from a soap? Addition glycerin (a natural humatant which draws moisture to your skin) is added to dissolve the green tea, so expect your soap to have a glorious dew on the surface. 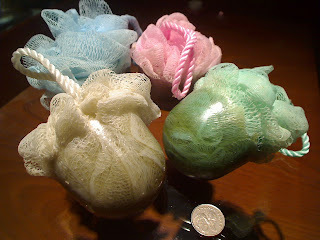 Dont throw away the pouf, recycle it for use with other soap when the green tea soap is used up!